Tasting notes: Hazy, citrusy, bready, light & mild. Tasting notes: Light, clean, crisp, and refreshing Summer picnic. 1959. Tool-and-die man Ermal Fraze grabbed a flat-top can of beer and asked, “Anyone bring an opener?” To his horror, no one replied, “Yes”. Out of the ashes of this indignity Ermal rose like a phoenix. And to mankind a glorious invention, now known as the pop-top can. 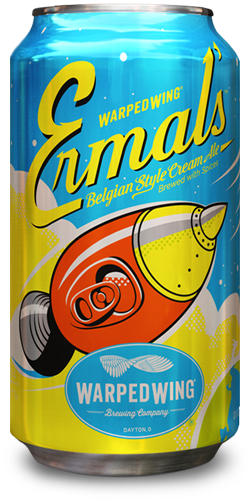 Ermal’s Belgian Style Cream Ale. Light, creamy, mildly spiced with a symphony of citrus notes. Pop the top and let them out.